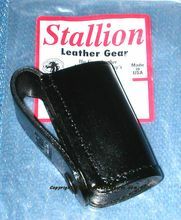 Leather Open top Pepper Spray Holder. Holds MK-IV cans with perfect fit. Long enough for most 4 oz cans of pepper spray like Fox Labs or Defense Technology or Mace. Belt Loop accommodates duty belt. Plain black finish. Very nice thick leather.